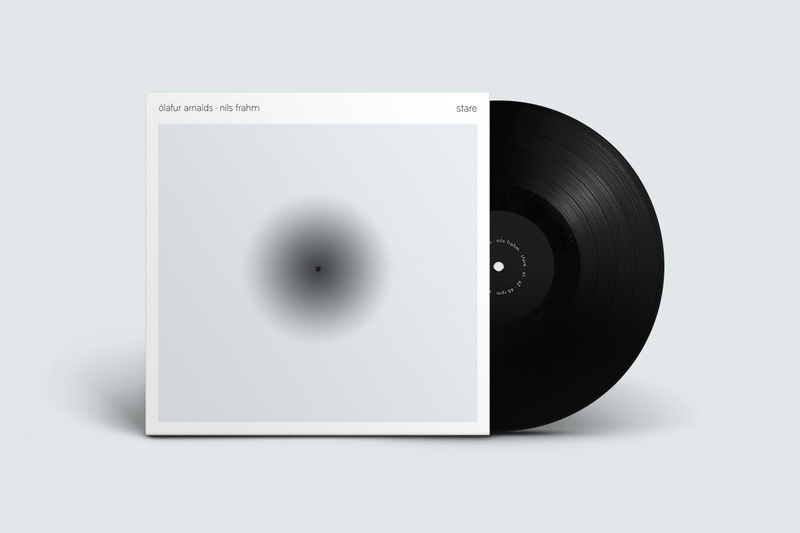 The ambient/electronic work Stare is a true family effort from Ólafur Arnalds and Nils Frahm with Anne Müller joining in on cello and all graphics by close label-friend and now in-house designer Torsten Posselt of Feld Studios. ‘I heard ‘Eulogy For Evolution’ for the first time 6 years ago and I was totally captivated. Impossible to know back then that I was supposed to meet Ólafur many years later as my label mate. Later when he took me along a tour of his we also noted that we kind of like hanging out together, doing important things like cover versions of long forgotten songs or eating veggie pizza. Also he would join my live set for a jam and I would return the favour by playing along with his set. ‘After having toured together and having had many inspiring late night conversations, I decided to visit Nils in his Durton Studio in Berlin for a weekend. We didn't have anything specific in mind, we just wanted to hang out, jam and eat some falafel. That's what we did, but somehow we also made 25 minutes of ambient bliss that weekend. After that we quickly decided we had to do the same in my studio in Iceland. Just hang out for a weekend and possibly make some music. So the album became kind of an Iceland vs. Berlin thing. I think you can hear it very well in the sound (side a vs. side b) and that is the most interesting thing about this record for me: that subtle but significant different in the characteristics of the music two people made in Iceland against what the same two people made in Germany. I'm not sure why we decided to keep it secret, it just happened. But it sure was fun! I remember a party at Robert's (Erased Tapes founder) flat in Berlin, where me and Nils stood in the corner the whole night whispering about the project. We then delivered the fully mastered record with finished artwork to Robert around the 5th anniversary of the label. It would have been nice to be there to see his face…"